On Tuesday, October 31st 2017 we had the opportunity to host media artist and scholar, Kate Sicchio from NYU on a series of talks and workshops on Movement and Wearables, as well as the concept of Choreotopology. Kate works at the interface of technology and performance. By opening a dialogue between how people move and how this may change by engaging with the digital, she aims to create choreography, performative scores, video, programming languages and hacking methodologies. During her workshop at the DXARTS 490B we explored ways in which we can design interactions for the body and movement. 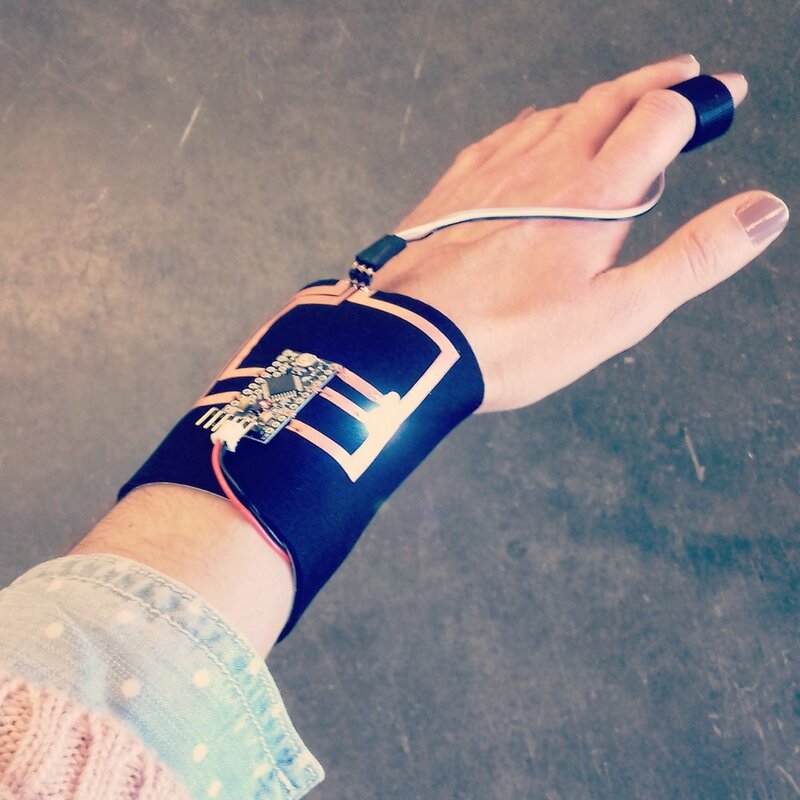 We experimented with methods from dance and choreography to design prototypes, as well as use movement and body parts to activate wearables in new ways. The aim of the workshop was to question how we engage with technology on the body and how technology may change how we move. 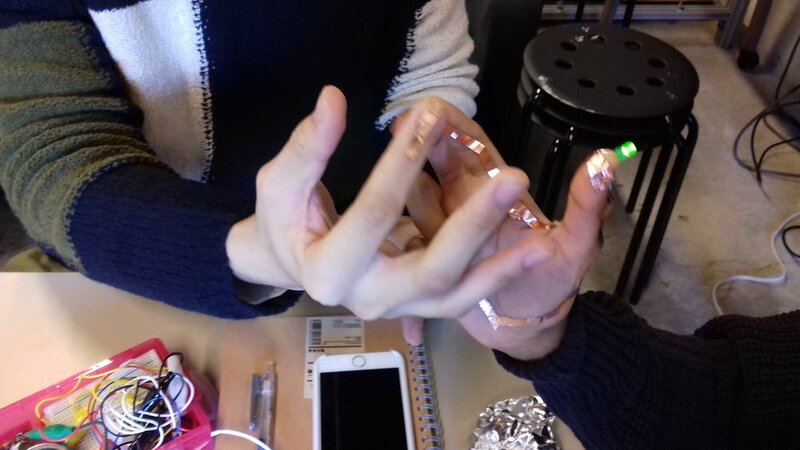 The workshop started off by engaging in fast prototyping with adhesive copper tape and LEDs to create simple 3V coin cell battery powered circuits on the body. The students then had to create separate switches to control the LED circuit. After experimenting with lighting up their circuits they had to work collectively to light up their circuits: one person have the LED circuit and another had to use the wearable switch to control it. Eventually more people were added into someone's circuit, acting as "switches" that had to work together to turn the LEDs on and off. Dr. Kate Sicchio is a choreographer, media artist and performer whose work explores the interface between choreography and technology. Her work includes performances, installations, web and video projects and has been shown in Philadelphia, New York City, Canada, Germany, Australia, Belgium, and the UK at venues such as Banff New Media Institute (Canada), V&A Digital Futures (London), FoAM (Brussels) and Artisan Gallery (Hong Kong). She has been written about in the press in The Guardian, Dazed Digital, El Diarios, and Imperica Magazine. She has presented work at many conferences and symposia including International Society of Electronic Arts (ISEA), ACM Creativity and Cognition, Digital Research in Humanities and Arts, Congress On Research in Dance, and Society of Dance History Scholars. She has given invited talks at EU Parliament (Brussels), Node Code (Frankfurt), Real Time Visuals Conference (Newcastle), Datarama (Newcastle), Times Up (Linz), Thursday Club Goldsmiths (London), Griffith University (Brisbane) and University of the Arts (Philadelphia). Her PhD focused on the use of real-time video systems within live choreography and the conceptual framework of ‘choreotopology’ a way to describe this work. Her research has been published by Leonardo Electronic Almanac, Computer Music Journal, Media N and Learning Performance Quarterly. Kate Sicchio has had extensive teaching experience within higher education. She has taught interactive technologies, choreography and many subjects in between to both undergraduate and masters level students. She has worked in the UK, Malta, Germany as well as the US. She was previously Senior Lecturer at University of Lincoln, Lincoln UK. She is currently a Visiting Assistant Professor in Integrated Digital Media at New York University.